Supports wireless charging with Qi and PMA enabled smartphones. All monitors should come with built-in wireless charging, but not many do. 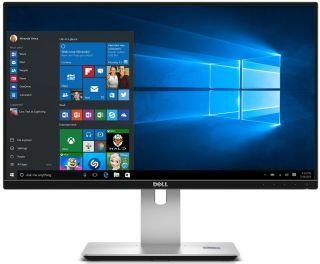 Dell's UltraSharp 24 (U2417HJ) does, however, and it's currently on sale direct from Dell for $220. The monitor is marked down from $360 to $280. After you add it to your cart, use coupon code SAVE140 to bring the price down to $220. That's the lowest around—the same monitor goes for $291 at B&H Photo, $293 at Newegg, and $296 at Amazon. Dell's U2417HJ features a 23.8-inch In-Plane Switching (IPS) panel with a 1920x1080 resolution at 60Hz and wide viewing angles (178 degrees vertical and horizontal). Other specs include an 8ms response time, 2,000,000:1 dynamic contrast ratio (1,000:1 typical), and 96 percent coverage of the sRGB color space. These aren't mind blowing specs for professional gaming by any means—the response rate is on the high side and it doesn't support G-Sync or FreeSync. This is more appropriate for someone who is in the market for a lower cost IPS display in this size range. The comparatively low price helps to overlook some of the downsides. As for other amenities, this monitor has a built-in USB 3.0 hub with four downstream ports, along with a microUSB port that is built into the wireless charging stand. The stand is height-adjustable and supports tilt, pivot, and swivel. You can grab this monitor on sale here.